Here’s an easy weeknight meal that the whole family will enjoy, and the best part is that you can have it on the table in less than 30 minutes. Yes, you heard me right, dinner in under 30 minutes. What mom or dad doesn’t like that? Another great thing about this pasta is that it’s made with fresh and whole ingredients, so you can feel good about feeding your family a quick and easy dinner. The heirloom tomatoes topped with parmesan and mozzarella taste like mini pizzas, but without the crust. My kids even begged for thirds on the tomatoes. I used heirloom tomatoes, but you can also use beefsteak, roma or vine-ripe tomatoes, whatever tomato strikes your fancy. These tomatoes would also make a great side dish or appetizer. I think they would even taste great topped on a pizza crust with some pesto or olive oil as the base sauce. OK, I think I just created a new recipe for pizza Friday. I love when that happens! Cook your pasta according to package directions. Drain and return to the pot. I would top each one with an even amount of both cheeses. 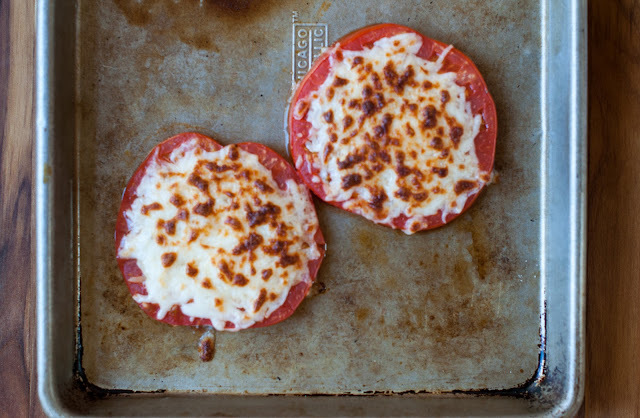 Why not get the kids involved and have them top their tomatoes with the cheese, its like topping a pizza. Its fun and gets them excited to eat tomatoes. 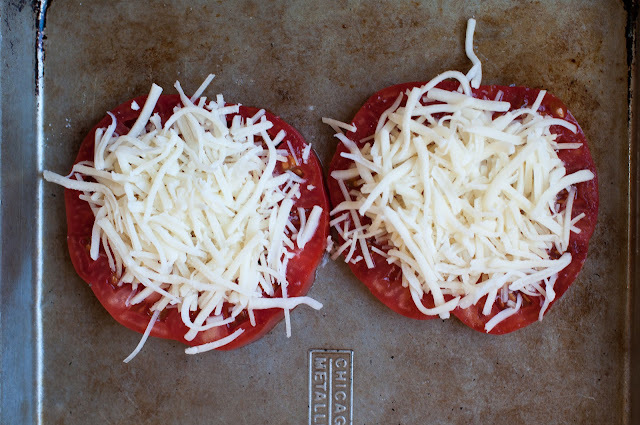 Broil the tomatoes until the cheese is bubbly and golden, 3 to 5 minutes. Don’t these tomatoes look insanely good? 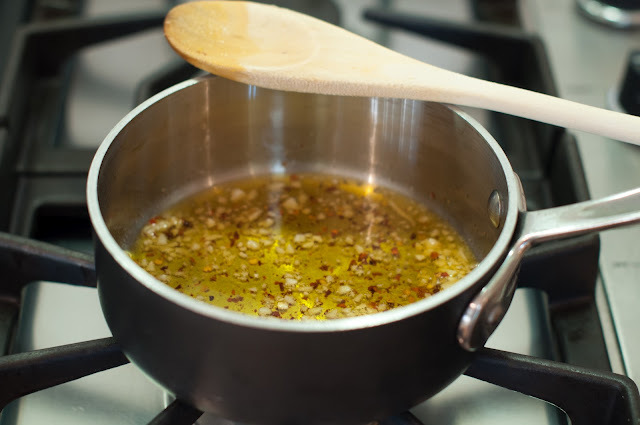 In a small saucepan or sauté pan, heat the 3 tablespoons oil with the chopped garlic and red pepper flakes over medium heat until fragrant, about 1 minute. 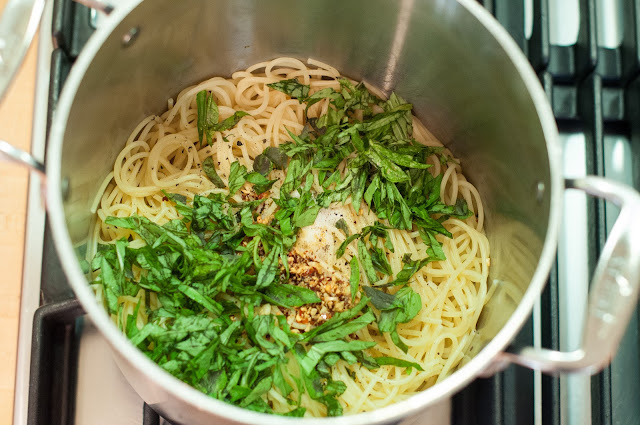 Add the garlic oil, 1/4 cup torn or julienned basil, 1/2 teaspoon salt and a dash of pepper to the cooked pasta and toss to combine. 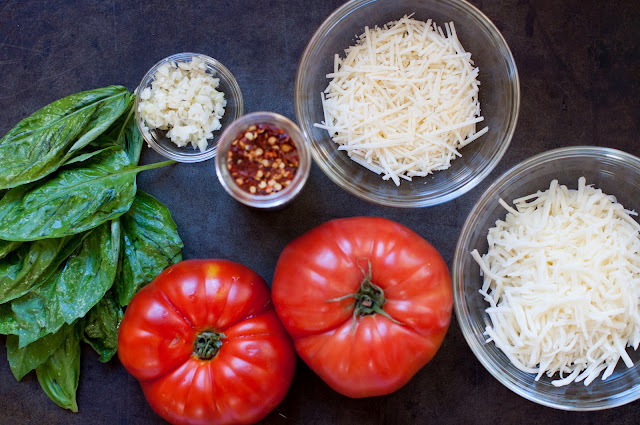 Serve the pasta up into individual bowls and top each bowl of pasta with the cheesy tomatoes, some fresh basil and grated parmesan cheese. The tomatoes are filling, so 2 tomato slices per bowl is plenty, but you may want a third, and that’s ok. That’s it folks. How easy was that to throw together? 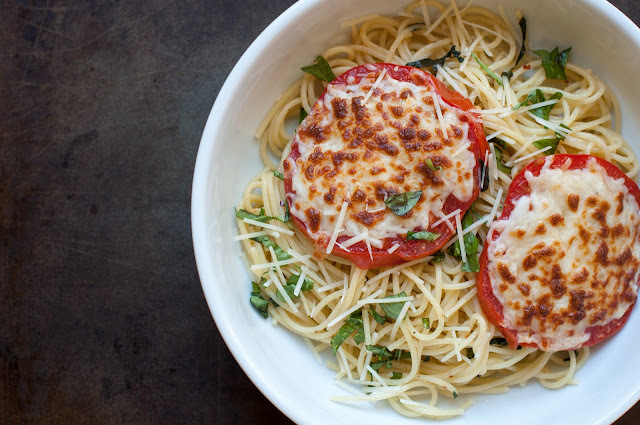 If you’re making this into a two-nighter meal, then you will want to make up some fresh cheesy tomatoes the next night. I served this pasta up two nights in a row. It was super simple, as I just had to throw the tomatoes together while the pasta was re-heating. If your kids love pizza and pasta, then they will love this recipe. I want to gobble up those tomatoes! They look divine – I love tomatoes in any form, and baked with cheese, yes please! this is the perfect dish! I always liked to put a bite of tomato and cheese on my fork at the same time and eat it and now it is already done for me! cheesy tomatoes are just wonderful and a dish under 30 minutes leaves time for mom to actually breathe! LOL! I’m always searching for healthy 30 minute meals. It just makes life that much easier during the week. Love this dish! This is definitely a healthier way to enjoy pizza and pasta. 30 min to cook this dish… sounds like this will be one of my weekday recipes. Ohmygoodness you and I have the same tastes. I love this for the end of summer. It’s been so hot down here lately and not feeling like fall at all. How about in Marin? I am dying for a trip up to SF. Hi Marina. It’s been warm up here, but not oppressively hot. The marine layer cools us down each day so it does feel a bit like fall, especially in the morning and late afternoon.